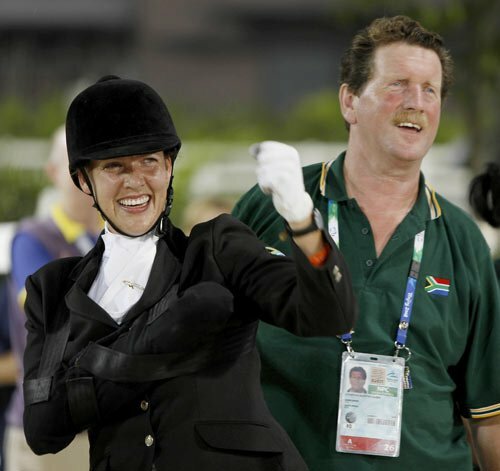 Philippa Johnson will represent South Africa as an equestrian in the Paralympics, having gone from competing at top dressage level to starting from scratch again after a car accident 13 years ago left the right side of her body disabled. Philippa competes at the Beijing Paralympics. Like many of her fellow athletes, Philippa Johnson’s Paralympic dream has not been without its obstacles. 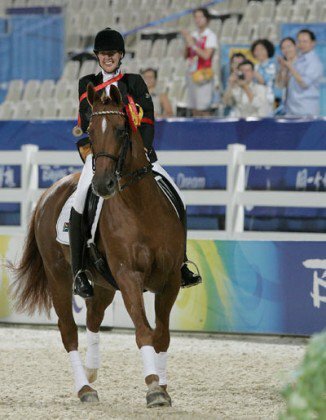 The South African equestrian’s career fell into jeopardy after a car accident in October 1998 resulted in a loss of all her strength in her right arm and 60% of the strength in her right leg. In January 1999, she proved there is no such thing as impossible and managed to climb back into the saddle even though her father had to lead her round to begin with. Just a year later, she accomplished a major feat when she entered her first competition since the accident — and went on to win. This proved only the beginning of a string of tremendous achievements for the strong-willed equestrian. In her first Paralympics, Athens 2004, Philippa won two silver medals only to build on this success in championing two gold medals in Hong Kong in 2008, which she considers the biggest accomplishment of her career so far. It’s back to Belgium and continue training as it's still competition training,” says Philippa, who came to Europe in 2002 to compete in a competition in Moorsele, Belgium and subsequently decided to stay, having found a soul-mate in her previous riding companion, a horse named Benedict. While South Africa will always be home for Philippa, it would appear Europe is her calling for the meantime.